We appreciate the price is important so in the unlikely event that you find the exact product elsewhere, as long as the sale and service conditions are comparible (in stock and available for purchase, identical product, delivery charges) we will match the price. For further price match conditions, click here to review. 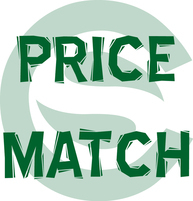 To request a price match, email sales@southerncarbs.co.uk or call us on 01293 533843 with the details of our product and the product to be compared (including the URL of the competitor's page).